FAIRBAIRN PROTOCOL self-defense / military hand to hand combat and non-firing weapons is unique in the world of CIVILIAN SELF DEFENSE and MILITARY HAND TO HAND COMBAT. This system takes no lessons from competition styles, does not use "defensive retreat" in its primary methods, and is drawn from a single source, the William Ewart Fairbairn Method. It is an offensive based system employing both empty handed and armed self-defense. WHAT IS THE FAIRBAIRN PROTOCOL METHOD? The system was created by interlacing military standard operating procedures (S.O.P.s), professional body guarding techniques, and World War II "Hand to Hand" Combat. Unlike most self defense programs which are basically a grouping of multiple, disconnected techniques; THE FAIRBAIRN PROTOCOL SYSTEM IS A FULLY CONNECTED, UNIVERSALLY APPLICABLE, "SELF DEFENSE SYSTEM". In this it stands above all other self defense programs! It has an over all philosophy, a supporting psychology, an empowering strategic and tactical base, and an excellent application of technique. It is, "THE COMPLETE PACKAGE"! Fairbairn Protocol System uses a select subset of battle tested, gross motor, combat techniques, drawn primarily from the works of the famous William Ewart Fairbairn. A true "Western Martial Art", the W.E.Fairbairn Method is non-contested as being the most documented, proven, successful, fighting system ever fielded in global war! With the inclusion of the Fairbairn Method, F.P.S. uses a repertoire of extremely versatile techniques. The following excerpt is from "The Legend of W.E. Fairbairn Gentleman & Warrior" - by Peter Robins, Nicholas Tyler, and Paul R Childs.
" in 1926/31 Fairbairn covered just a few more techniques in each category but without a doubt one can see that his earlier syllabus formed the basis for what was to follow. Looking at the 1915 manual, and his later works right up to and including his last manual on the subject for the Cyprus Police in 1956 ("Unarmed Combat ~ December 1956), it is clear that he found out early on what was effective and practical. This clearly led him to see no reason to change, not for change's sake as is common today. For many people this lack of modification seems to show a lack of progress. but consider this : might constant change and adaptation show that one is not so confident in one's system as first perceived" ? This is one of the many reasons we have abandoned other methods and sytles in pursuit of teaching the Fairbairn Method teach and in doing so preserve it in its original and unimproved form. Contrary to the common practice of collecting multiple techniques to deal with single circumstances. The FAIRBAIRN PROTOCOL SYSTEM employs simplicity, stripping fighting down to its basics, achieving more, with less, increasing expertise. Every "W.E.Fairbairn Method" technique F.P.S. is in their pure form with zero modification. All non-Fairbairn techniques meet the strict protocols Fairbairn himself codified. Non-firing weapons are incorporated into the training program day one to build the & quotOne mind, any weapon " mindset that supports improvisation and confidence. The combative core is empowered by military strategies, tactics and understandings, derived from proven Standard Operating Procedures (S.O.P.s) used by militaries worldwide. These S.O.P.s enable threat detection, deterrence, and preparedness, producing a practitioner who is mentally prepared, able to avoid situations before they occur, and ready when confrontation goes to violent conflict. Even the F.P.S. instructional technique stands out as unique. Structured to systematically develop a confident offensive mindset and physical expertise, it ingrains technique and confidence. Every strategy, tactic, and technique is delivered with detailed anatomical, physiological, and psychological information. Reactive partner based drills develop mental maps allowing quick recognition of opportunity. While maintaining safe training practices, full force, force on force drills forges technical competence and confidence, further setting the confident, offensive mindset. Rapid technical expertise is achieved by tapping into the student's own adaptation and learned behavior mechanisms. Throughout every training session student safety is consistently retained at a premium. " Train safe, train long ", and " Never let your enthusiasm exceed your skill ", is the order of the day. The end result is a winner’s mindset, a rock solid repertoire of ruthlessly effective techniques and the confidence and physical ability to succeed. IS FAIRBAIRN PROTOCOL TRAINING FOR YOU? If you find yourself subject to the normal realities and constraints of everyday life, but are serious about self protection; If you seek these qualities in life or business, then it is truly worth your time to look into training with FAIRBAIRN PROTOCOL. FAIRBAIRN PROTOCOL H2H is that opportunity! WHAT MAKES FAIRBAIRN PROTOCOL STAND OUT? First thing that we need to point out is that for the specific goal of self-defense a large portion of today's martial arts, self-defense systems are incomplete. This is mainly because they only provide instruction in fighting techniques, mixed to some degree with a secondary aspect; usually cardiovascular conditioning and flexibility. In comparison, Fairbairn Protocol H2H's instruction teaches methods of detection and deterrence, how to deal with the transition from non-violence to violence, PLUS fighting techniques. In this way, the Fairbairn Protocol System (F.P.S.) bridges the entire gap between everyday life and surviving an unavoidable violent conflict. This ability is very important because the transition period is a true killer. Described as the space of time that exists between the specific moment when the enemy initiates combat and when you get up speed. This is how the transition period works. An aggressor’s intentions are often concealed or disguised by distraction or deceit. This is when they are at their most dangerous. It is during this period, aided by the "element of surprise", that they shut down your options and entrench their control. The strategies, tactics, and techniques taught by the Fairbairn Protocol H2H are designed to keep you effective, and in control, throughout this critical period . If we look the normal pattern of acquiring a combative skill, a substantial amount of time is spent on training. Yet the outcome of this intensive investment is often a practitioner who has become "Not bad" at executing a multitude of techniques, in a classroom setting. This shortcoming is due to the vast diversity of techniques taught, the time spent on secondary focuses such as developing cardiovascular conditioning. Simply the amount of time that can be spent on any one given activity is hindered. This is very different than training intended to keep you and your loved ones alive. Fairbairn Protocol H2H is 100% committed to achieving survivability in the face of violence. The F.P.S. practice of concentrating training on highly effective techniques ensures a rapid attainment of expertise in a minimum amount of time and further optimizes the benefits of refresher training. In some way everyone is familiar with Asian martial arts and their excellent reputation for teaching ancient wisdom and discipline. Fairbairn Protocol H2H has no such reputation; probably never will. The Fairbairn Protocol System is a-political and therefore intentionally offers no philosophical component. Fairbairn Protocol H2H devotes total attention to the instructional delivery and obtainment of a real ability to conclusively respond to a variable of violence attacks and the F.P.S. carries this forward. F.P.S. methods are not guided by rules and regulations, or political correctness. Freed from these self-defeating constraints, the F.P.S. focuses exclusively on surviving a real-life aggression. The only methods it uses are those that possess the maximum capability to quickly eradicate a threat. In the same of survival, Fairbairn Protocol H2H supports the highly effective, but politically incorrect perspective that in a violent confrontation defensive posturing is a falsehood and that the only viable response is an immediate and aggressive offense. This perspective is reflected throughout the system. For example, in order to seize a chance to survive a life-threatening conflict, the F.P.S. advocates the immediate use of a weapon to defeat an unarmed enemy. The system does not deal with right or wrong or pride, just effective survival. As we look around us we note that there are a surprising number of schools where you can encounter instructors who want you to believe that their methods are the best in the world and that their word is indisputable fact. Fairbairn Protocol H2H does not profess to be the best. It is not the best system in the world. The fact is that there is no one best system. We do profess that we do teach a logical, battle proven system, built on experience and fully answered questions; and that it can produce in you real confidence and real ability. The Fairbairn Protocol Method stands out in today's crowd of martial art styles, military systems, and self-defense methods. 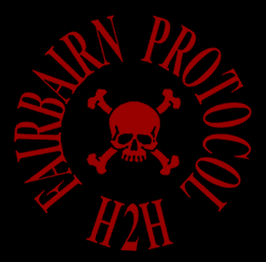 The Fairbairn Protocol H2H is a good solid choice for anyone who believes that someday, somewhere, for whatever reason, they may find themselves in harm's way and negotiating just will take you to safety! The Fairbairn Protocol System can save the lives of your loved ones and yourself! TAKE THIS PASSAGEWAY TO VISIT US AT OUR FAIRBAIRN PROTOCOL H2H YOUTUBE CHANNEL"
INTERESTING IN HOSTING A FAIRBAIRN PROTOCOL COURSE, SEMINAR, OR PUBLIC OR CORPORATE SPEAKING ENGAGEMENT?